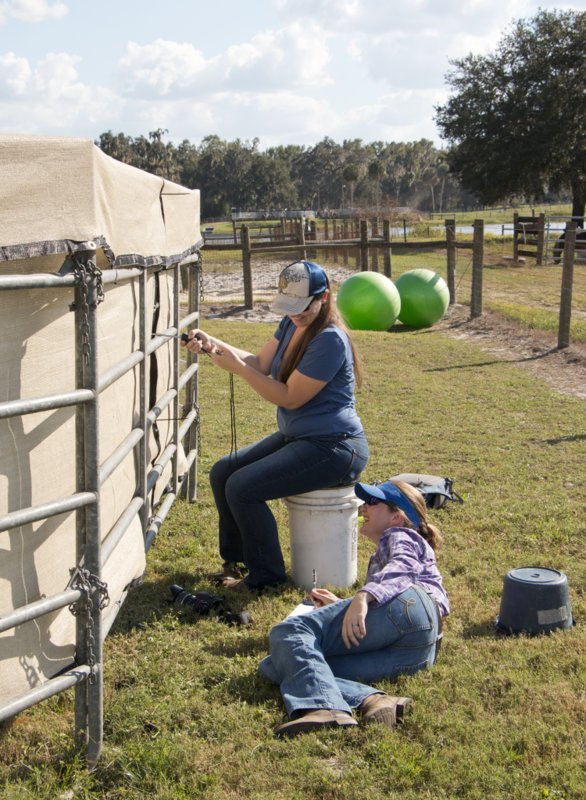 (L-R) Masters student Samantha Lewis and Samantha Brooks, PhD, prepare the testing umbrella outside the corral. Samantha Brooks, PhD, scares baby horses for a living. In her defense, it’s just a little fright, and it is for science. 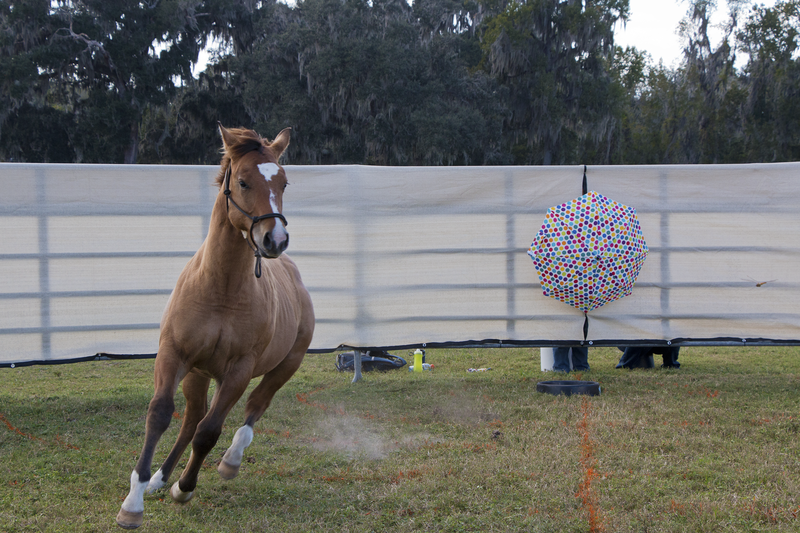 Brooks, an assistant professor in the department of animal sciences, studies equine genetics as a member of the University of Florida Genetics Institute. Her work unfolds across three arms– trait mapping, gene expression/transcriptome work and the relationship between genome structure and function. Some of her projects include studying whether there is a genetic component to temperament, the causes of epilepsy in equines and the pathology of sweating disorders. “When I am asked to sum my research up in one sentence– we use genomic tools to improve the health, welfare and performance of the horses and species of exotic hoof stock,” Brooks said. One of her goals is to “map locations in the genome responsible for a particular disease or trait of interest in a horse.” This is the motivation behind her project startling colts. How humans work with horses has changed drastically over the last century. Tractors replaced the once-ubiquitous draft horse, leaving behind sport and pleasure riding as the major commercial use for horses. When humans began to domesticate horses, it is likely they prioritized docile, tractable mounts. Sedate animals don’t mind spending all day plodding in front of a plow. However, now that people in developed nations use horses almost exclusively for sport, researchers are looking into whether an easy-going nature might not be be the ideal they once thought. So they’re studying foals to determine whether there is genetic component associated with certain traits such as skittishness. The University keeps a few dozen horses at the 65-acre Horse Teaching Unit south of campus. In the fall, UF offers an undergraduate course on equine handling. Brooks partners with the class to collect data on foal behavior. 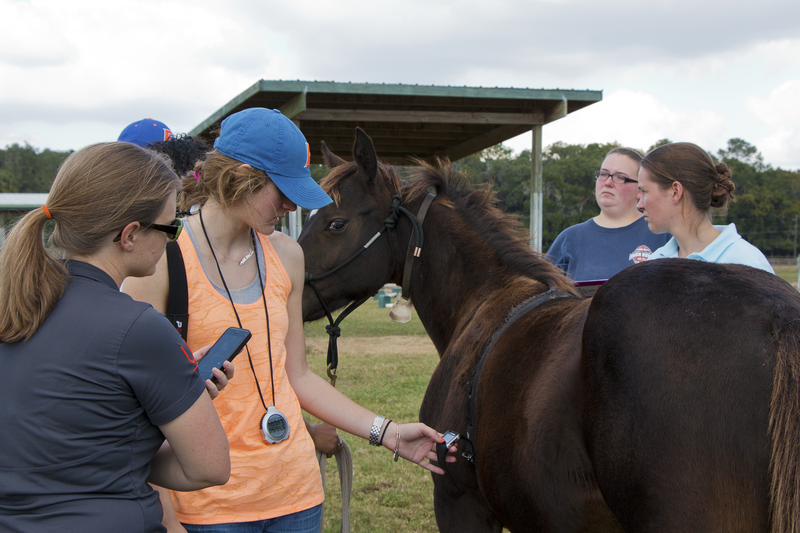 First, a member of Brooks’ research team measures the foal’s heart rate. Next, a student walks the foal into a pen, and leaves it alone with a pan of feed. While the animal is eating, a researcher on the other side of the wall pops open a polka-dotted umbrella. Most of the foals hop lightly aside, glance around for a threat and then resume eating. A few are so frightened, they bolt away from the pan, and refuse to go back for several minutes. The researchers take note of the foal’s heart rate before and after the scare, and how far it runs away. Brooks compares this data with analysis of the foals’ genomes to assess whether this behavioral trait has a genetic component. (L-R) Carrisa Wickens, PhD; Sommer Dougherty; Cara Vogel and Ellen Rankin prepare the foal for the experiment. At a land-grant university with a major health bent, researchers who do work outside these disciplines are sometimes left feeling a little marginalized. When a scientist’s work doesn’t have an obvious value for humans, they have to work that much harder to prove its worth. But it teaches flexibility– they learn to think creatively, and finesse their research to fit the fewer grants for which they qualify. That’s part of the reason Brooks ended up studying desert livestock in Qatar. Before joining UF, Brooks was on faculty at Cornell University. Cornell has a sister institution in Qatar. Brooks received a $1 million grant from the Qatar National Research Foundation to study the genomes of three species of major cultural significance in the Arab peninsula– the Arabian horse, Dromedary camel and Arabian oryx. Arab peoples have bred horses to thrive in the desert for millennia. Brooks said researchers have found historical breeding records that are several centuries old. The Arab horse is distinct from other breeds. Capable of competing in races across the desert for distances of up to 100 miles, Arabian horses also often have one less vertebra in their backs. Dromedary camels have long been valued as beasts of burden, able to carry heavy loads over long distances with little food or water. They are also raised for their meat and milk. Brooks studies these animals to discover what has enabled them to thrive in such a severe environment. The goal is to sequence the genome structure of all three species, and create a reference other scientists can use. Identifying these adaptations may empower her to help other species to adapt to the changing global climate. “Tank” bolts after the umbrella is opened. Brooks is often asked if she’s working to build a faster racehorse. She’s not. Rather, the lab is focused on breeding healthier horses. They seek to unravel the genetic secrets related to strength and stamina that will help equines bear up under the demands placed on them as competitors and companions. Yet another research focus– studying a sweating disorder called anhidrosis– is reflected in this. Animals with anhidrosis cannot produce sweat. Being unable to cool themselves adequately makes them vulnerable to heatstroke and even death. “We know so much about the human genome, and we know so much about the mouse genome, yet there is still so much more we can learn about the genomes of these interesting and uniquely adapted species,” she said.